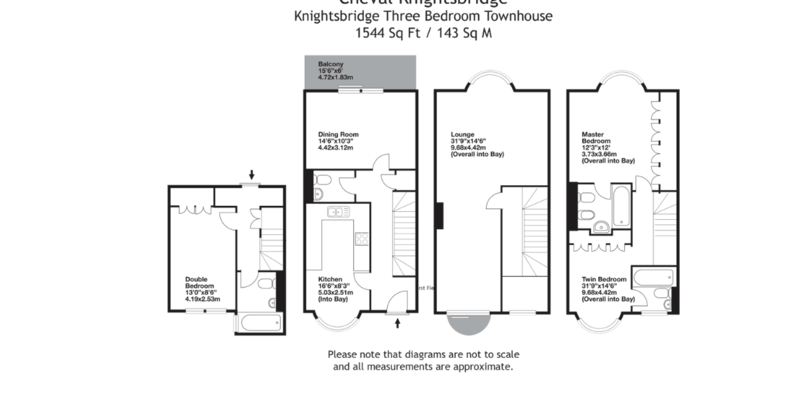 Located in a quiet street parallel to Brompton Road, Knightsbridge are our Three Bedroom Townhouses in Cheval Place. Providing the ultimate in Luxury, each with its’ own private entrance they are perfect for families, friends or colleagues needing a home in the capital. These generously sized townhouses are spread over four floors. Sumptuous interiors feature contemporary lounges with plentiful seating for a busy household; modern Miele Kitchens provide the perfect base from which to create great evenings in for an intimate family occasion hosted in the large dining room, or for a house full of friends. All bedrooms are ensuite ensuring privacy and a calm environment in which to enjoy those quiet moments. A Guest Cloakroom also comes as standard. Air-conditioning is provided in the Reception Room and Master Bedroom. With Knightsbridge on your doorstep, an abundance of opportunity awaits. Culture; Nightlife; Shopping and Entertainment; making Cheval Knightsbridge the perfect choice when in London for business or leisure for short or long term requirements.